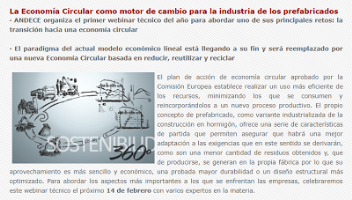 We are glad to announce that ANDECE, the Spanish National Precast Concrete Association (Asociación Nacional de la Industria del Prefabricado de Hormigón), has invited our team to present VEEP Project in a Webinar on Circular Economy and Precast Concrete Products next 14th February. In particular, Project Partner Sonia Fernández (UNE) will introduce the audience to VEEP at 16.00 pm (Spanish Hour). We express our sincere gratitude to ANDECE for this dissemination opportunity and we invite you to join the webinar on Thursday! Contact ANDECE here to register for the webinar. VEEP team is proud to announce that the project was presented at CEN/Technical Committee 350/WG 7 on Tuesday, 22nd January 2019. 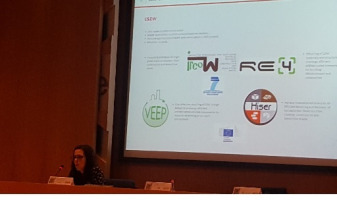 UNE, the Spanish Standardization Association, is part of the VEEP Project participating as standardization partner with the task of report VEEP on applicable standards and promote the dissemination of the VEEP Project through relevant CEN Technical Committees and its stakeholders. After a general explanation of the VEEP Project, project partner Jaime Moreno from TECNALIA presented to the CEN/TC 350/WG 7 experts some preliminary achievements regarding the properties and composition of the new VEEP green concrete recipes, the singularities of the new precast concrete elements and preliminary results concerning the life cycle cost and CO2 reduction of the novel VEEP solutions in comparison with BAU scenarios. In his presentation it was also highlighted the standardization task lead by UNE that allows this kind of dissemination actions and contacts with CEN Technical Committees. This first contact was very fruitful as it opened possible future networking and collaboration opportunities with CEN/Technical Committee 350. Keep following VEEP channels for more updates about the innovative technologies, materials and building products that will be developed by the Project Consortium and future interaction with CEN Technical Bodies. Are you curious about the latest results achieved by VEEP Project Consortium? Do you like to learn more about the partners who are collaborating to develop VEEP innovative technologies and materials? The 2019 HARMONI Summit is an event dedicated to inspiring discussions, target-orientated solution development and cross-sectorial networking. This year edition takes place in Brussels (Belgium) on 16 and 17 January 2019. We are glad to announce that VEEP coordinator Anna Paraboschi is attending the event - where notice of the project has been given - to discuss about the main project barriers. Visit the official website of the event to learn more! 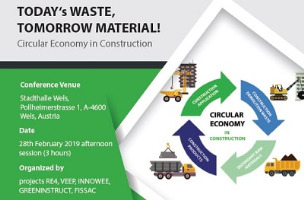 VEEP Project Consortium is pleased to invite researchers, industrial companies, professionals and wide public interested in the topic of circular economy for workshop “Today‘s waste, tomorrow material” that will take place in Wels (Austria) on 28th February 2018. The workshop is organised in the framework of WSED 2019, an annual conference that brings together more than 650 delegates from over 50 countries from business, the research community and the public sector. During the event, project partner RINA will introduce the latest results and lead interactive discussions related to the promotion of the circular economy in the construction sector. In particular, Anna Paraboschi – VEEP Coordinator – will present make a presentation about the project at 14.15. 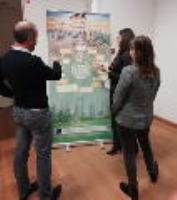 Moreover, an interactive poster session will take place at 15.30 and will allow the participants to ask questions about VEEP innovative technologies and materials and exchange ideas about the project. The event is organised together with RE4, INNOWEE, GREENINSTRUCT and FISSAC. Workshop registration is free of charge: register now! 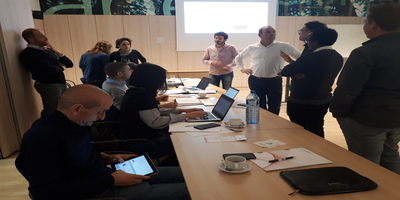 On 21&22 November 2018, the VEEP Consortium met in Bilbao (Spain),at TECNALIA premises, for the fifth progress meeting. The meeting focused on the projects' updates after 2 projects years and was coupled with the 3rd Exploitation Workshop organization where the BFMULO matrix was introduced. Moreover Partners visited the TECNALIA laboratory and get insight in the lab scale technologies for the new concrete based on CDW production. VEEP team is glad to announce that we took part in the 8th ECTP open Conference that took place at the Centre for Fine Arts in Brussels on November 13-14, 2018. 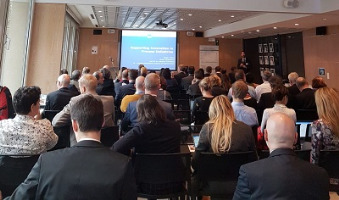 During the event, current and anticipated innovation in the built environment field was discussed and plenary sessions with high-level speakers from academia, industry and the European Commission introduced the global scheme and visions from various stakeholders. Project partner Nobatek disseminated the project's latest results, focusing on the sustainable and innovative materials developed. VEEP partner Delft University of Technology is taking part to the event dedicated to Global Challenges! The Innovation Expo 2018 (IE2018) will take place in Rotterdam, Netherlands, on 4 October 2018. It aims at taking innovations further, realising breakthroughs, and thus contributing to the social challenges of the world. VEEP team is proud to announce that during the event, there will be the launch of the C2CA Technology (developed in collaboration with other two EC funded projects: C2CA and HISER). Therefore, VEEP project partner Delft University of Technology will present the mobile ADR and the HAS to the public. The Innovation Expo is going to be a very good opportunity to show to industry, government and all interested people that it is indeed possible to close the concrete loop and to implement circular economy on the market as well. Visit Innovation Expo official website to learn more and meet us in Rotterdam! VEEP second video is out! 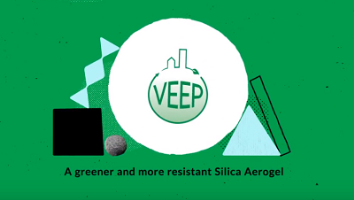 Learn more about VEEP greener and more resistant Silica Aerogel: watch the second video now! Join VEEP team in Prague! VEEP Project Partner Fénix TNT is glad to invite you to the conference “Circular Economy in Construction” that will take place in Prague on 20th September 2018. The conference constitutes an important networking opportunity for organisations and institutions working in the construction field. The theme of the event is related to the circular economy, which is a sustainable development concept, which enables for a functional and prosperous relationship between the nature and the human society. By closing the loops of materials in perpetuous cycles, circular economy opposes the current linear system, where resources are turned into products, sold, consumed, and after a very short lifespan burned, landfilled or lost in other ways. FENIX team will introduce three European projects related to the circular economy: RE4, FISSAC and VEEP and will lead one of the afternoon workshop "Raw material industrial symbiosis as the basis for functioning of the circular economy on both Czech and European scale". The event will be held only in the Czech language. 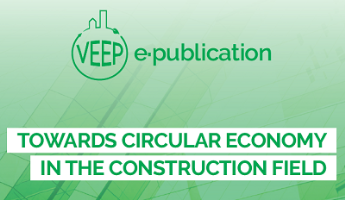 We are glad to announce that VEEP project was presented by Petra Colantonio during the "Circular Economy in Construction Conference". The event was organised by project partner FENIX and it was held in the Czech language. The conference was organised in order to get together all stakeholders from construction demolition waste sector, people who are involved or are interested in topic of circular economy and industrial symbiosis, introduce national success stories, international opportunities and projects (H2020, Intereg) with this topics through event with conference session (presentations) and workshop session (interactive discussions on topic with stakeholders). VEEP project was presented via brochures, powerpoint presentation and video and the event turned out to be a success as it was attended by 70 stakeholders. VEEP partner CML attended the event to disseminate the project’s results! 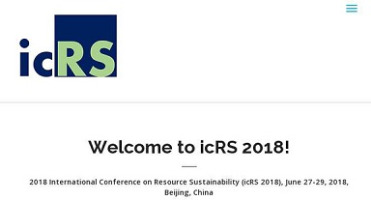 The International Conference on Resource Sustainability 2018 took place in Beijing, China, on 27-29 June, 2018. It serves as a platform for researchers and practitioners around the world with diverse background and expertise to share the most recent ideas, outcomes, and practices on resource sustainability. 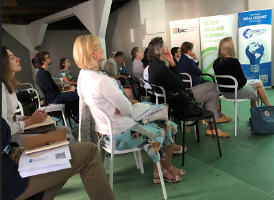 Project partner CML participated in the event and held the presentation “Life cycle costing of construction and demolition waste recycling for cost-effectively building retrofits”. Visit the official website of the International Conference on Resource Sustainability 2018! The World Material Forum took place in Nancy, France, from 27 to 29 June 2018. 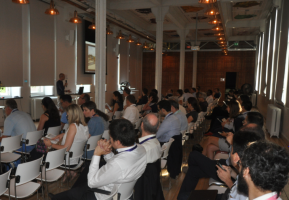 The 4th edition of the event was dedicated to the theme “The Future of Materials: Use Smarter, Less and Longer”. VEEP Project Partner Francisco Ruiz - CEO Keey Aerogel took part in Plenary Session 4 “Reduce materials intensity for building industry”. In the framework of Plenary Session 4, Francisco Ruiz held a presentation titled “Novel circular economy business model of high-added value products for energy efficiency: from C&DW to Aerogels”. Aerogel is the best insulator material, characterised by a thermal conductivity inferior to 15mW/mK, but it is expensive and fragile. This is why VEEP Aerogel will be produced from concrete and demolition waste, making it greener and cheaper. Moreover, it will be made more resistant through Silica. Learn more about KEEY AEROGEL presentation on the official website of World Material Forum 2018! The International Workshop on Environmental Management, Science and Engineering (IWEMSE) is an event dedicated to the promotion of scientific information interchange between researchers and practitioners in the fields of Environmental Management, Science and Engineering. The 2018 edition was held in Xiamen, Fujian, China from June 16 to June 17, 2018. 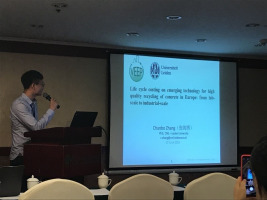 VEEP project partner Leiden University took part in the event to give a presentation about economic analysis on ADR and HAS, entitled “Life cycle costing on emerging technology for high quality recycling of concrete in Europe: from lab-scale to industrial-scale”. The large amount of End-of Life concrete generated during the demolition stages in Europe and the traditional treatment of it often results in considerable economic impact. Over the last years, novel technology has been developed aiming to guarantee high quality recycled concrete aggregates for use in new concrete manufacturing, thereby closing the concrete loop. The innovative technology of integrated Advanced Drying Recovery (ADR) and Heating-Air classification System (HAS) is developing for cost-effectively and high value-added recycling of concrete. To ensure the proposed ADR and HAS solution will lead to a more cost-effective EOL concrete management, the paper uses LCC as a tool from a financial perspective to quantify the potential economic improvement of the emerging EOL recycling solutions shifting from lab-scale to industrial-scale. 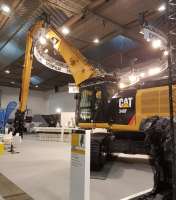 Wascon 2018 took place in Tampere, Finland, from 6 to 8 June 2018 and it aimed at showing both the state of the art and the future developments in the field of construction. 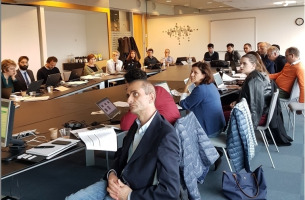 Main topics discussed during the conference regarded lessons learnt from practical projects, interaction and chemical compatibility with other materials and structures, new products, applications and machinery, LCA and emission modelling and much more. 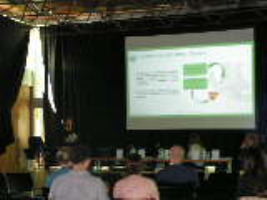 VEEP project partner TECNALIA participated in session 2A “Recycling of C&DW I”, that took place on Wednesday, 6th of June 2018. In particular, Jaime Moreno, Iñigo Vegas , David Garcia and Eunate Goiti held a presentation titled “From C&DW to high added value prefabricated concrete components – The European VEEP project”. Over the last years, novel technologies have been developed aiming to guarantee high quality of recycled materials for their use in new materials (specially recycled concretes), thereby closing the loop. However, some wastes still faces technical barriers to be incorporated into new materials/products and consequently, they are often down-cycled. It is, for example, the case of fine recycled concrete fractions (0-4 mm), or the case of minor (e.g. glass) and emerging (e.g. mineral wool) C&DW materials that have not yet found technological and business solutions along with their whole circular supply chain, being mostly landfilled. On the other hand, concrete is the most widely used material in building, with a growing trend towards prefabrication. The European precast concrete sector and its associated supply chain face diverse needs for improvement in resource efficiency (reduction in natural resource consumption, design for reuse, increase, lighter solutions, enhanced thermal performance etc.) leading to higher competitiveness. To face these challenges, the main objective of the VEEP project (Horizon 2020) is to eco-design, develop and demonstrate a series of new cost-effective technological solutions for the massive retrofitting of our built environment, aiming at cost-effectively reducing building energy consumption. These new technological solutions will lead to novel closed-loop circular approaches for C&DW recycling into novel multilayer precast concrete elements PCEs (for both new buildings and refurbishment) incorporating new concretes as well as superinsulation material produced by using at least 75% (by weight) of C&DW recycled materials. Visit the official website of the WASCON 2018 to learn more! On 6 June 2018, the VEEP Consortium met in Schlierbach (France),at KEEY AEROGEL premises, for the fourth progress meeting. The meeting focused on the projects' updates and ongoing activities and was coupled with the 2nd Exploitation Workshop organization. 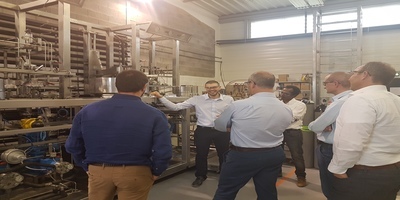 Moreover Partners visited the KEEY AEROGEL laboratory and get insight in the set up of the pilot line for the green aerogel production capable to save up to 40% energy consumption. The ConWEEB "Converting Construction Waste into Energy Efficient Buildings" Workshop will present innovative solutions for conferting CDW into new prefabricated elements.The Workshop will present up to date results achieved among the H2020 projects: VEEP-INNOWEE-GREENINSTRUCT-RE4. On 22/11/2017 VEEP project has been presented in the framework of APSE conference Promoting circular economy for a greener road construction! Register on the VEEP website and enjoy the VEEP PROJECT 1st VIDEO! 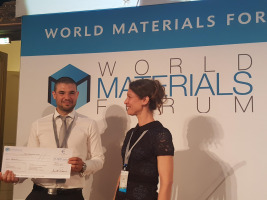 The Technology for the manufacturing of silica Innovative Closed-loop Aerogels by KEEY AEROGELS and TECNALIA was awarded with one of the three prizes within the world forum materials held in Nancys (France) last June 20-28th. KEEY AEROGELS was awarded with the “START-UP CHALLENGE” Award. VEEP project has been presented at the DDR EXPO Event. DDR Forum & Expo 2017 was an event never seen before, where professionals from different trades, but all related between them, had the opportunity to meet each other thanks to the same goal: go towards the Circular Economy. This, as well as the chosen place to celebrate it, Brussels, allowed the participation of several stakeholders from different European institutions (associations, federations, included the European Commission…) that participated as speakers and panelists in the conference sessions, covering by this way multiple topics of interest for the attendants. The first project International Workshop "Engaging with Stakeholders" has been held in the framework of the BIBM Congress (17-19 May 2017) on May the 17th in Madrid (Spain)! Different industrial stakeholders from more than 20 Worldwide countries registered at the event! 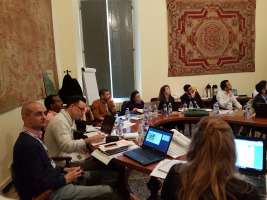 On 14 March 2017, the VEEP Consortium met in Genoa (Italy),for the first six months progress meeting. The project, funded in the frame ofHorizon 2020 EEB-2016, will realize a breakthrough innovation in the field of prefabricatedconcrete components development. It will make available precast panelsembedding high percentage of Construction and Demolition waste and low costaerogel development. The meeting focused on the projects' updates and ongoing activities. The 4-year H2020 VEEP project has been launched! The 4-year H2020 VEEP project has been launched! 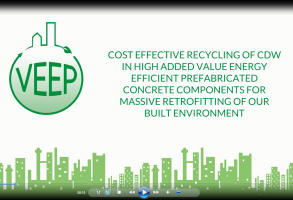 VEEP “Cost-effective recycling of CDW in high added value energy efficient prefabricated concrete components for massive retrofitting of our built environment” is an ambitious project around closed material loops for Construction and Demolition Waste (C&DW), based on circular economy principles. The project aims to eco-design, develop and demonstrate new cost-effective technological solutions that will lead to novel closed-loop circular approach for C&DW recycling into novel multilayer precast concrete elements incorporating new concrete and superinsulation material produced by using at least 75% (by weight) of C&DW materials. 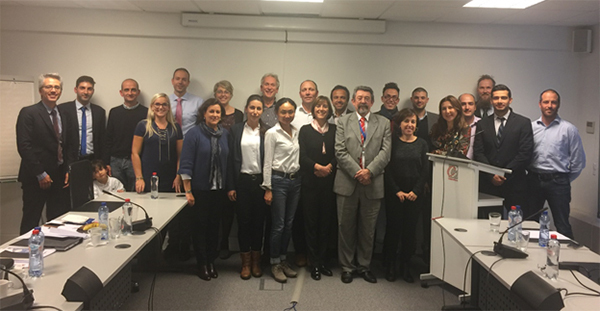 VEEP Kick-Off meeting has been held on 19th October 2016 in Brussels (Belgium) at BIBM premises. 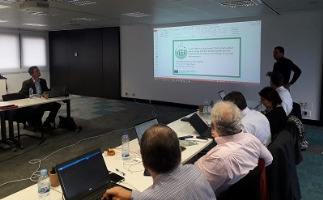 The Consortium met to discuss the project ambition and objectives and its coordinated implementation, with tools, tasks and assignments for the following months. The Kick-Off meeting has been coupled with operative sessions organized as Workpackages (WPs) workshops on October the 20th in order to finalize a detailed WPs planning and launch the upcoming activities. Next General Assembly meeting of the project will be organized at D’Appolonia premises (Genoa, Italy) in March 2017. The VEEP Project has been presented at the event “Progettare tra mare e monti” organized by the Project Management Institute – NIC! The VEEP Project has been presented at the event “Progettare tra mare e monti” organized by the Northern Italian Chapter of the Project Management Institute in Genoa on October the 21st 2016. 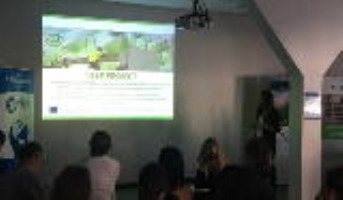 During the event the Project Coordinator (Dr. Anna Paraboschi) gave a presentation “Progettare per un futuro sostenibile” (“to design for a sustainable future”) focused on the VEEP project as an example of project devoted to introduce technologies, processes and products enabling circular economy based concept application. During the presentation Project Management features and the cooperation tool used in the framework of the project have been also introduced. More than 100 people attended the event! The event has been organized by PMI-NIC (Project Management Institute- Northern Italian Chapter) that is a reference for everyone interested in project management topics all over Northern and Central Italy. The Chapter, in particular, aims at contributing to professional growth in project management, promoting researches and thematic seminars, introduce the project management profession, principles and techniques in companies, universities and other professional associations.